Divorce is a controversial subject among people of faith. When Christians go through divorce, they need an attorney who will be aggressive yet maintain an eternal focus. 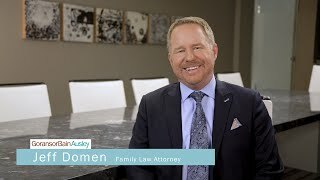 Whether your spouse is struggling with the 3 A’s (Abandonment, Addiction or Abuse), or whether you are just looking for a Christ-centered counselor who can offer biblically sound advice, Jeff Domen can grant you the peace of mind to navigate family law issues with honor. Mr. Domen passionately advocates for his clients’ best interests, whether that means reaching a settlement out of court or going to trial. He is proud of his most recent achievement—winning a jury trial by 12-0 to secure primary custody of two children for his client. Mr. Domen is a graduate of Baylor University School of Law. He is a member of the Collin, Dallas and Denton County Bar Association and serves in many capacities within those organizations. Mr. Domen is a member of Hope Fellowship Church where he is active in the Adventure Kids Ministry and lives in Frisco with his wife and four children. His competitive nature is not only fulfilled in the courtroom, but also through local sports leagues, where he plays soccer, baseball and coaches youth sports. Mr. Domen speaks at continuing legal education seminars across the state on family law topics, trial strategies, and ways to keep children safe from an alcoholic spouse. Further, Mr. Domen and his wife, Melanie, teach classes on parenting based on the book, “Loving Our Kids On Purpose,” by Danny Silk.